Head-on collisions are one of the deadliest types of accidents, resulting in more than 10 percent of motor vehicle fatalities despite accounting for just 2 percent of accidents, according to the National Highway Traffic Safety Administration (NHTSA). A look at the physics of head-on crashes makes it easy to understand why they're so dangerous: If a vehicle traveling at 50 miles per hour is involved in a head-on collision with a similarly sized vehicle also traveling at 50 miles per hour, the resulting force is like driving into a brick wall at that speed. Victims who survive head-on collisions may be left with serious lacerations and contusions, broken or crushed bones, neck or head injuries, traumatic brain injuries, spinal cord traumas, and other injuries. In addition to being extremely painful, the injuries sustained in a head-on crash often require extensive medical treatment and time away from work. 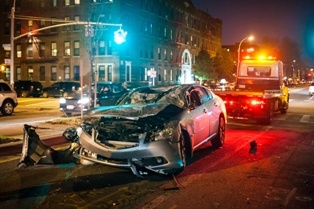 However, if the accident and injuries were caused by the other driver's negligence, the victim may be entitled to compensation for damages, such as medical bills, future accident-related medical expenses, property damages, lost wages, loss of earning potential, pain and suffering, and more. Seeking compensation for injuries sustained in a head-on collision requires showing that the other driver was negligent. In some cases, proving fault in a head-on collision accident can be challenging, and may require testimony from expert witnesses, such as an accident reconstructionist. Were You Hurt in a Head-On Collision? If you were injured—or lost a loved one—in a head-on collision, the experienced attorneys with the Morris James Personal Injury Group can help you fight for the justice and compensation you deserve. Contact us today to schedule an appointment for a free initial consultation to discuss your case with one of our knowledgeable legal professionals.